Coordinated Science Laboratory, University of Illinois (USA) , invited by Manish Gupta, 1992. Electrical and Computer Engineering, Louisiana University at Boton Rouge (USA) , invited by professor. J.R. Ramanujam, 1992. Computer Architecture department, Queens University at Belfast (Nord Ireland, UK), invited by professor Ron Perrot, 1994 and 1996. IBM T.J Watson Labs, New York (USA), invited by Jaime Moreno and Giovanni Pacifici, 2005. Department of computer Science at Rutgers University (USA), invited by Professor Ricardo Bianchini, 2007. Université Paul Sabatier, Toulouse (France), invited by Professor Jean-Marc Pearson, 2009. Dependable Systems group at Coimbra University (Portugal), invited by Dr. Luis Mouro Silva, 2010. He has a consultative and strategy role with a visionary task related to next generation technology and its impact. He is both a creative thinker and influential collaborator base on that he has worn many hats throughout his long career. He acts as an expert advisor and teaches on these topics for various organizations, companies and mentors entrepreneurs. At present, he acts as an Analytics Advisor at the IThinkUPC company. He has held several appointments as an independent expert. Some of the featured are: European Comission (Information Society and Media Directorate) in the preparation of the Work Programme 2011-2012 for the area “Disruptive Solutions for Energy Efficient ICT” – Future Emerging Technologies Proactive (2010 final report here); Friends of Europe’s Greening Europe Forum at “Greening Europe – Roundtable Opportunities and challenges of greening ICT” (2011); Swiss Academy of Engineefing Science (2012-2013); Fundació Centre Tecnològic de Catalunya (for elaborating white papers); “Comissió d’Innovació del Consell de la Cultura de Barcelona” commission of the Barcelona’s town hall (2013-2014); Member of the Steering Committee IEEE -TCSC Technical Area of Green Computing (2010 –2013). He has been elected as a technology evaluator by many organisations and companies. Some of the featured are Ministerio de Ciencia y Tecnologia of Spain, Dirección General de Investigación of Community of Madrid , Universitat Jaume I de Castelló (Spain), Departament d’Universitats i Recerca de la Generalitat de Catalunya, Fundació La Caixa, Autoritat Catalana de Protecció de Dades, Science Foundation Ireland. He is doing technology consulting at Spanish companies and member of management boards (e.g. UPCnet management board during 2011-2013 and 2018-), member of the advisory boards (e.g. Barcelona Big Data Center of Excellence) or mentoring of entrepreneurs. He organises and teaches customized in-house training (English, Español and Català) to meet the particular technology knowledge needs of a certain company or institution. As a research manager at BSC he is has participated in a number of competitive EU/Spanish calls and Networks of Excellence, a lot of them involve University-Industry Technology Transference . Before being manager at BSC, he was a member of the European Center for Parallelism of Barcelona (CEPBA) (1994-2004) and a member of the board of managers of CEPBA-IBM Research Institute (CIRI) (2000-2004). 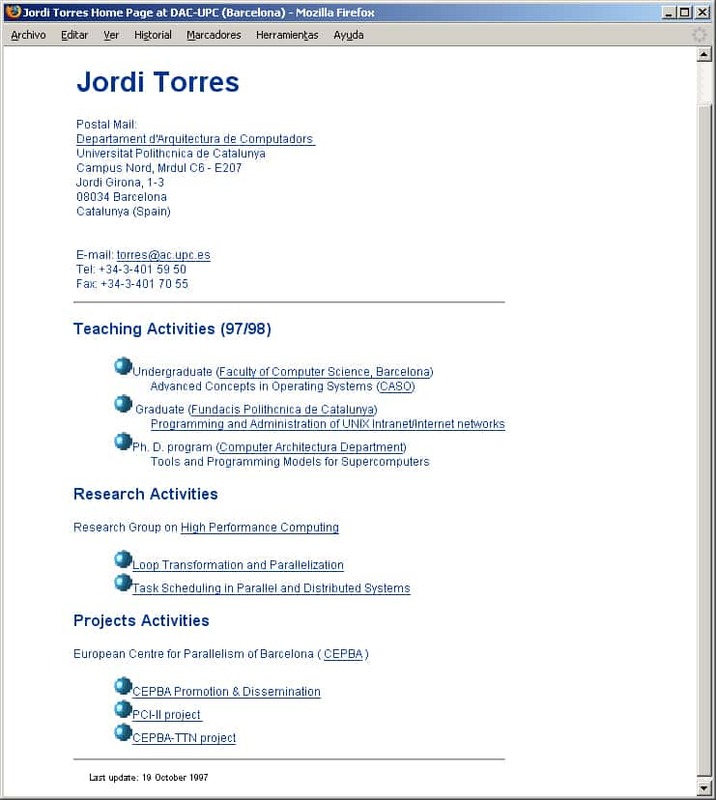 During 1992-2000 he has been the coordinator of the promotion and dissemination of technology at European Center for Parallelism of Barcelona (CEPBA). He has been Vice-dean of Institutional Relations at the Computer Science School (1998- 2001) and a member of the University Senate (Claustre) and member of the Board of Governors (Junta de Govern) (2011-2013). He has also participated in numerous university management activities and institutional representation. He is member of the BSC-CNS Access Committee core team. The Deep Learning For Science Workshop. In conjunction with ISC’19, Frankcfurt, Germany. June 20, 2019. Organizing Committee. 1st Deep Learning on Supercomputers Workshop. In conjunttion with SC18, Dallas, Texas. November 16 2018. Organizing Commitee. 2013 IEEE International Conference on Big Data (IEEE BigData 2013). Tutorial co-chair. CGC2011 – International Conference on Cloud and Green Computing, Dec. 12-14, 2011, Melbourne Australia. Steering Committee. 2010 IEEE International Workshop on Green Computing (GreenComp’10) associated with HPCC’10, Melbourne, Australia, Sep. 1-3, 2010. Steering Committee. Workshop Grids Meet Autonomic Computing. Barcelona, Spain, 15 June 2009. Web chair. “Seventh IEEE International Symposium on Cluster Computing and the Grid” (CCGrid 2007). Rio de Janeiro – Brazil / May 14-17, 2007. Posters and Exhibits Chair . “3rd International Conference on Self-Organization and Autonomous Systems in Computing and Communications (SOAS’2007)”, IEEE. Leipzig, Germany, September 24-27, 2007. Program co-Chair. “Computing Frontiers 2006” (ACM) , Ischia, Italia, 3-5 Mayo 2006. Publicity Chair. IBM SP Scientific Computing User Group (SciComp). Barcelona, 8-11 Mayo 2001. Organizing committee. VI Jornadas de Paralelismo. Barcelona, 2-3 Julio 1995. Organizing committee. Primeras Jornadas de Paralelismo. Sitges (Barcelona), 23-25 Octubre 1990. Organizing committee. 9th IEEE International Conference on Cloud Computing (CLOUD 2016), June 27-July 2, 2016. San Francisco, USA. Program Committee. The 2016 IEEE International Conference on Cloud and Big Data Computing (IEEE CBDCom), July 18th – July 21st 2016. Toulouse, France. Program Committee. IEEE International Conference on Multimedia Big Data (BigMM2015). Beijing, China, April 2015. Program Committee. 12th ACM/IEEE/USENIX International Conference on Autonomic Computing. ICAC 2015. July 7-10, 2015 in Grenoble, France. program committee. Workshop “High Performance Graph Mining”, i tindrà lloc dintre del “21st ACM SIGKDD Conference on Knowledge Discovery and Data Mining” a Syndey, 10 d’Agost 2015. Program Committee. 3rd International Workshop on Citizen Networks – CitiNet. 25th September 2014, Lucca Italy. Program Committee. The 2014 IEEE International Symposium on Network Computing and Applications (NCA14). Cambridge, MA, USA, on 21-23 August 2014. Program Committee. 6th IEEE International Conference on Cloud Computing Technology and Science (IEEE CloudCom) 2014 (Big Data Track) to be held on December 15th-18th, 2014 in Singapore. Program Committee. 2014 High Performance Computing & Simulation Conference (HPCS 2014) is to be held July 21-25, 2014, in Bologna, Italy. Program Committee. 19th IEEE Workshop on Dependable Parallel, Distributed and Network-Centric Systems (DPDNS14), Program Committee. 2nd workshop on Extreme Green & Energy Efficiency in Large Scale Distributed Systems (ExtremeGreen2014), 2014. Program Committee. IEEE International Conference on Green Computing and Communications 2013: Storage, Big Data, and Cloud Computing. which will will be held in Beijing, China during August 20-23, 2013. Program Committee. 2013 IEEE International Conference on Big Data (IEEE BigData 2013). Program Committee. ExtremeGreen: Extreme Green & Energy Efficiency in Large Scale Distributed Systems. May 13-16, 2013, Delft, The Netherlands. Program Commitee. 8th International Conference on Network and Service Management (CNSM). Las Vegas, USA. 22-26 October 2012. Program Commitee. 17th IEEE Workshop on Dependable Parallel, Distributed and Network-Centric Systems. Shanghai, China. May 21-25, 2012. Program Commitee. First international workshop on power-aware systems and architectures (PASA) in conjunction with the international conference on parallel processing (ICPP’12). Pittsburgh, PA, USA September 10-13, 2012. Program Commitee. Second Workshop on Management of Cloud Systems (MoCS 2012), July 1st 2012 Cappadocia, Turkey .Organized in association with the Seventeenth IEEE Symposium on Computers and Communications (ISCC 2012). Program Commitee. 3rd International Conference on Green IT Solutions (ICGREEN’12) in Geneva. Switzerland 2nd-3rd of Jul 2012. Program Commitee. 2nd International Conference on ICT as Key Technology against Global Warming – (ICT-GLOW 2012) Vienna, Austria . September 3rd-7th, 2012. Program Commitee. CAGing : Collaborative and Autonomic Green computing” track during the WETICE 2012 (21st IEEE Intentional Conference on Collaboration Technologies and Infrastructures) Toulouse, 25-27 June 2011. Program Commitee. The 3rd International Conference on Future Energy Systems: Where Energy, Computing and Communication Meet. e-Energy 2012 will take place in Madrid on 9-11 May 2012. Program Commitee. The First International Conference on ICT as Key Technology for the Fight against Global Warming (ICT-GLOW’11), Toulouse, France. August 29-September 2, 2011. Program Commitee. Second International Conference on Energy-Efficient Computing and Networking, e-Energy 2011, Columbia University from May 30 to June 1, 2011. Program Commitee. Seventh IEEE Workshop on High-Performance, Power-Aware Computing (HP-PAC), May 16 – 20, 2011. Anchorage, Alaska, USA. Program Commitee. 1st IEEE/ACM Workshop on Autonomic Computing for Economics. Co-located with the The 8th International Conference on Autonomic Computing (ICAC) which takes place in Karlsruhe, Germany between the 14th and 18th of June 2011.Program Commitee. Second International Conference on Energy‐Efficient Computing and Networking Columbia University, New York, USA May 4 ‐ 6, 2011. Program Committee. 7th Workshop on High-Performance, Power-Aware Computing (HPPAC 2011) to be held May 16, 2011 in Anchorage, Alaska, USA, in conjunction with the 25th Annual International Parallel & Distributed Processing Symposium (IPDPS 2011). Program Commitee. 11th IEEE/ACM International Symposium on Cluster, Cloud and Grid Computing (CCGrid 2011) , Newport Beach, California, May 23-26, 2011. First International Conference on Energy-AwareHigh Performance Computing. ENA-HPC 2010. Hamburg, Germany, September 16-17, 2010. Program Committee. 2010 IEEE International Workshop on Green Computing (GreenComp’10) associated with HPCC’10, Melbourne, Australia, Sep. 1-3, 2010. Program Committee. 6th workshop on High-Performance Power-Aware Computing (HPPAC 2010), to be held Apr. 19th, 2010 in Atlanta, Georgia, in conjunction with the 24th Annual International Parallel & Distributed Processing Symposium (IPDPS 2010). Program Committee. 1st Int’l Conf. on Energy-Efficient Computing and Networking (e-Energy 2010). University of Passau, Germany. April 13-15, 2010. Program Committee. The 7th International Conference Advance Computing and Communication (ADCOM 2009). 14-18 December 2009. Bangalore, India. Energy Efficient: Computing Systems, Data Centres & Operating Systems Track. Program Commitee. The 6th IEEE/IFIP International Conference on Management of Networks and Services. CNSM 2010. Niagara Falls, Canada, October 2010. Program Committee. The 9th IEEE International Symposium on Network Computing and Applications (NCA10) 15 – 17 July 2010, Cambridge, MA, USA. Program Committee. The second edition of Grids Meet Autonomic Computing (GMAC)in association with ICAC 2010, Washington DC, USA. June 2010. Program Committee. Workshop on Isolation and Integration for Dependable Systems (IIDS), Co-located with EuroSys’2010. Paris, France, April 13, 2010. Program Committee. Workshop on Dependable Parallel Distributed and Network Centric Systems – DPDNS’2010 – April, 2010 Ohio State University, USA, in conjunction with IPDPS. Programme Committee. The 10th IEEE/ACM International Symposium on Cluster, Cloud and Grid Computing to be held in May 2010 in Melbourne, Australia. CCGRID 2010. Program Committee. The 11th International Symposium on Stabilization, Safety, and Security of Distributed Systems (SSS 2009). Autonomic Computational Science track. Lyon, France, November 3-6, 2009. Program Commitee. “Fourth International Conference on Grid computing, high-performance and Distributed Applications (GADA’09)”. Nov 2 – 6, 2009, Portugal. Program Commitee. The 6th International Conference on Autonomic Computing and Communications (ICAC-09) Barcelona, Spain June 15-19, 2009. Program Committee. Workshop Grids Meet Autonomic Computing. Barcelona, Spain, 15 June 2009. Program Committee. 11th International Symposium on Stabilization, Safety, and Security of Distributed Systems (SSS 2009), Autonomic Computation Science track. Lyon, France, November 03-06, 2009. Program Committee. 5th International Conference on Self-organization and Adaptation of Computing and Communications (SACC 2009) Leipzig, Germany, 23-25 March 2009 , Program Committee. 24th Annual ACM Symposium on Applied Computing. Special Track: Wireless Sensor Networks, self-organisation and emergence (WSN) Waikiki Beach, Honolulu, Hawaii, USA. March 8 – 12, 2009, Program Committee. 3rd International Conference on Complex Distributed Systems (CODS 2009). Leipzig, Germany, 23-25 March 2009. Program Committee. DPDNS’09 Workshop on Dependable Parallel Distributed and Network Centric Systems – May, 2009 , Roma , Italy in conjunction with IPDPS. Programme Committee.